I am very disappointed, because later 4 days of use, battery went down and the charger neither is able to reactivate. Really bad experience. Really quirk dispatch ,will definitely use you again. 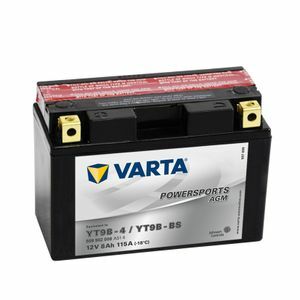 Great replacement battery for my Yamaha XT660Z Tenere. Great service from Tayna as always. Battery very well packed and delivered promptly. Was sent wrong battery even though I called up 2 times to confirm what I wanted and what it is was for, told them both times it was a gel battery I required, assured this was correct.........it wasn't. Very very frustrating. Does 'what it says on the tin'. no problems with battery and started bike after 1 year of storage. Comes with seperate acid works well. Thanks TAYNA for help getting the right fitment, which is vital for my 2008 -XTZ660, as the space for a battery is very tight. Battery arrived in Italy in 5 days, which was as i hoped for.Filling was easy and bike starts perfectly.Great! Quick delivery, correct product - good service. Right parts quick delivery, great price. Fantastic service, and price. Thank you! !